The average running shoe has a life span of approximately 700 to 1100 kilometres. This value will of course vary depending on the body weight of the runner, how often they are running, the surfaces they run on, their running form, the shoe materials etc. Unfortunately more often than not, most runners will not be aware they need new shoes until their body tells them otherwise – placing them at risk of injury. Rather than waiting for this to happen or following a vague suggested kilometre warranty, we encourage all our patients to check for the following signs that will indicate your shoes need replacing. The heel counter (back of the shoe) is designed to ensure the heel remains firmly fixed to the sole of the shoe. As a shoe wears out, this area weakens allowing unnecessary movement of the rear foot in the shoe. 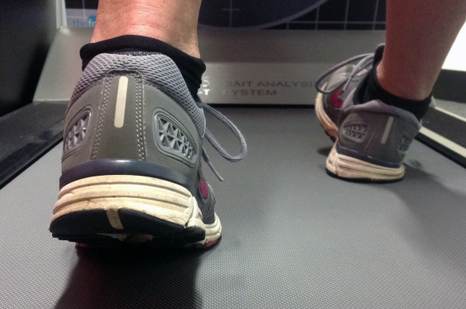 To test the condition of the heel counter, apply firm pressure half way up the back of the heel. 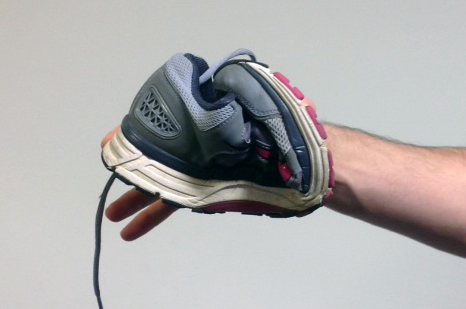 If this region of the shoe collapses under thumb pressure, you may need to consider a new pair of shoes. Structured running shoes are designed to flex in line with the balls of the feet. Anatomically this is where the foot breaks as we go to push off. Ideally, the mid part of the foot should remain stable as we head into the propulsion or push off phase of walking and running. As a shoe wears out, the midsole material can become overly flexible. 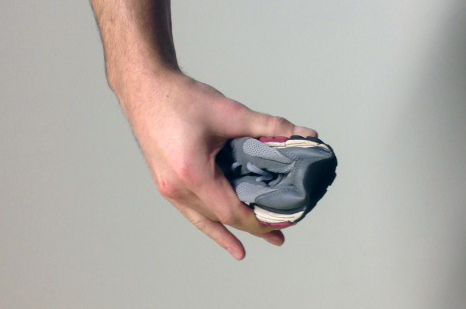 Rather than flexing at the ball of the foot, the sole may also continue to flex further back in the mid foot. This makes it difficult for the foot to develop the rigid structure it needs for propulsion. It is assumed that by having adequate midsole stiffness any twisting force will be mostly absorbed by the shoe rather than the foot. Again as the midsole material breakdown, the ability of the shoe to protect the foot in this manner is reduced. Head into any specialty running store today and you’ll be hard pressed to compress the width of a new structured running shoe on display. Apply the same test to an old pair of runners at home and you’ll be surprised by the difference. In light of the way our centre of mass progresses over the foot, the outside of the shoe will usually wear out quickest. Many structured running shoes also incorporate a dual density midsole, which compounds the issue. 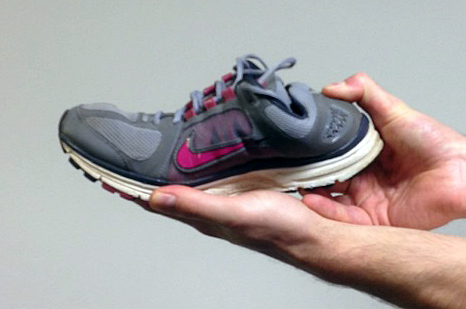 Sound structural integrity along the outside of the shoe is particularly important during heel strike. A shoe that has worn out through this region will collapse as our heel makes ground contact. Instead of allowing the foot to naturally roll in, it shifts the foot out placing exceptional strain on the outside of the ankle and leg. Have a friend watch you walk/run from behind. If there is noticeable collapse of the outside of the shoe as your strike, again you may want to consider replacing your shoes. Disclaimer: These guidelines are based on a traditional “structured” running shoe. These principles will not apply to “minimalist” or “barefoot” style running shoes. The shoes used in this article are heavily worn and do not reflect the true structure of the shoe on purchase. At no stage should the images above be interpreted as a reflection of the shoe brand, but rather accepted features of any structured running shoe that is worn out. Andrew studied podiatry in New Zealand, graduating in 1992, and received an Award for Excellence in diagnosis, orthotic design and manufacture. He has worked in numerous multi-discipline clinics and sports medicine centres both in Australia and New Zealand. Andrew established Lane Cove Foot Clinic in 2000 which, following the establishment of The Foot Group in Brookvale in 2010, is now the Lane Cove clinic of The Foot Group. Andrew is a member of the Australian Podiatry Association, Australasian Academy of Sports Medicine and Sports Medicine Australia.